Download the Via app from your smart phone’s app store. Metro has partnered with Via to offer on-demand rides to 3 select transit stations. 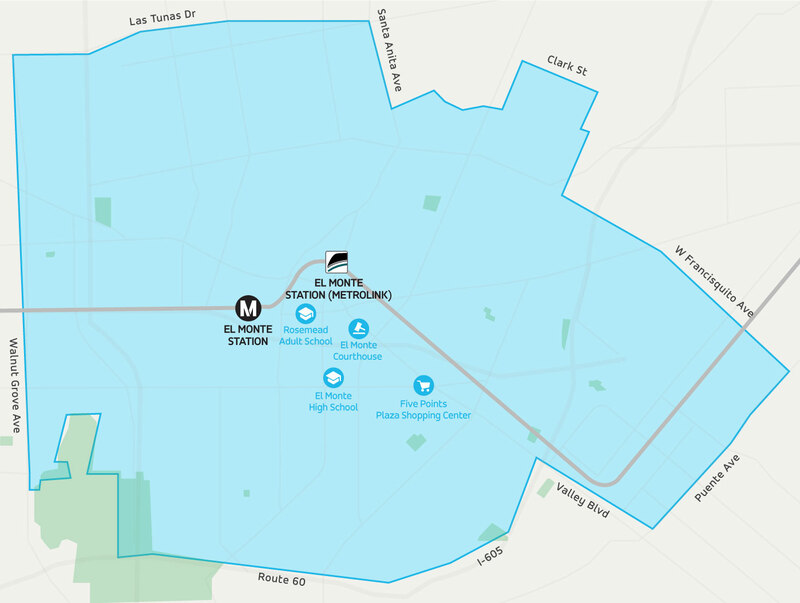 Monday to Friday, 6am to 8pm, customers can book a seat in a shared, dynamically-routed vehicle to or from Metro’s North Hollywood, El Monte, and Artesia stations. Rides can be requested by using Via’s mobile app or by calling over the phone. Via will match passengers with other riders going their way to the same transit station. Rides will be shared, affordable, accessible and on-demand. Customers with disabilities, including those with service animals, wheelchairs, or other mobility aids or who need additional assistance to board or alight, can request on-demand rides in the app or with the call center. All rides are a flat rate per ride. Registered Metro LIFE participants ride for free. TAP card holders pay $1.75 per ride. All other rides are $3.75. Via frequently offers ride promos and discounts. Check Via’s app for the latest discount offered. Rides are available Monday through Friday, from 6:00am to 8:00pm. All rides are a flat rate per ride. **Although Customers are asked to input their TAP card number when creating an account, customers must pay for their ride using a credit, debit, or pre-paid card. **Via frequently offers ride promos and discounts. Check Via’s app for the latest discount offered. If you are a Metro LIFE (Low Income Fare Program) participant, make sure to input your associated TAP card number when creating an account to qualify for free rides. Via will accept payment with credit, debit, or pre-paid cards. If you experience a problem with Via's mobile app or run into other issues using the service, please contact Via's customer service line at (619)731-0710 or email Via at losangelesriders@ridewithvia.com . Don't have a smart phone? Call Via's call center at (619) 731-0710 to create an account and book a ride. 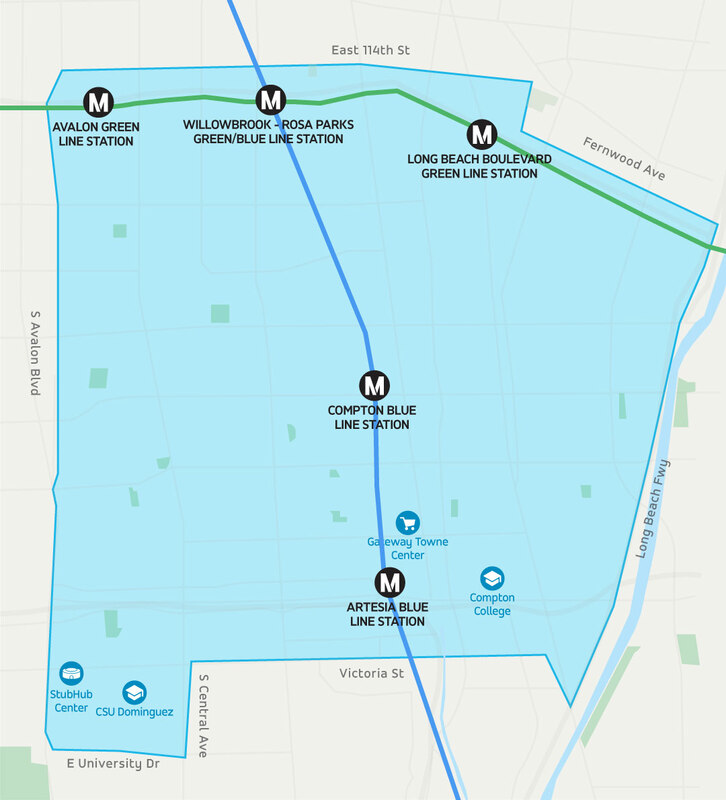 The service zones include areas around the North Hollywood, El Monte, and Artesia stations. 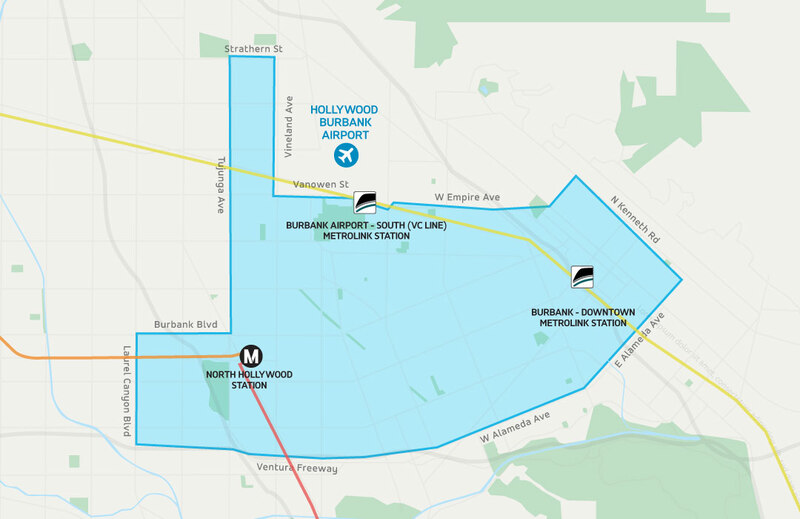 Via provides on-demand rides to and from Metro’s North Hollywood Station, Metrolink’s Burbank – Downtown station, and Metrolink’s Burbank Airport – South station. You can contact Via's Live Support call center during service hours at (619) 731-0710 or by email at losangelesriders@ridewithvia.com . Via's service hours are Monday-Friday, 6am-8pm. Via is an on-demand ride-hailing service that takes multiple passengers heading in the same direction and books them into a shared vehicle. You can book a ride using Via’s app for iPhone or Android or by calling Via’s call center at (619) 731-0710. 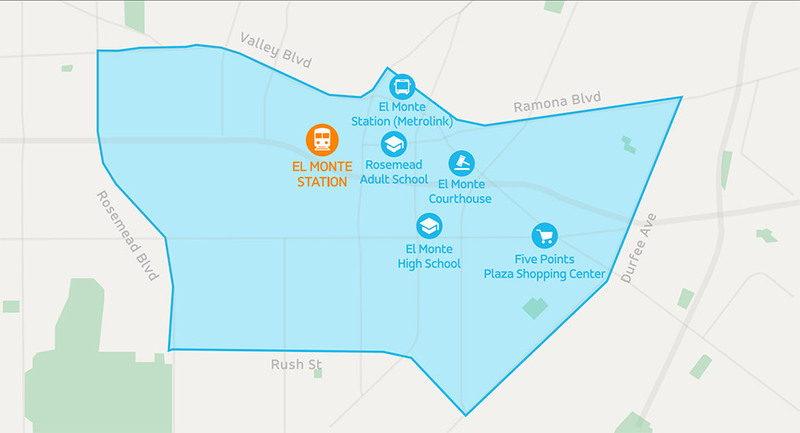 LA Metro has partnered with Via to provide rides to or from Metro stations within Via's zones of operations. Via is a corner-to-corner service. A driver will pick you up at a Metro station and then drop you off within a couple blocks of your requested destination, and vice versa. This helps Via ensure that even with multiple pickups, trip times are comparable to a taxi. 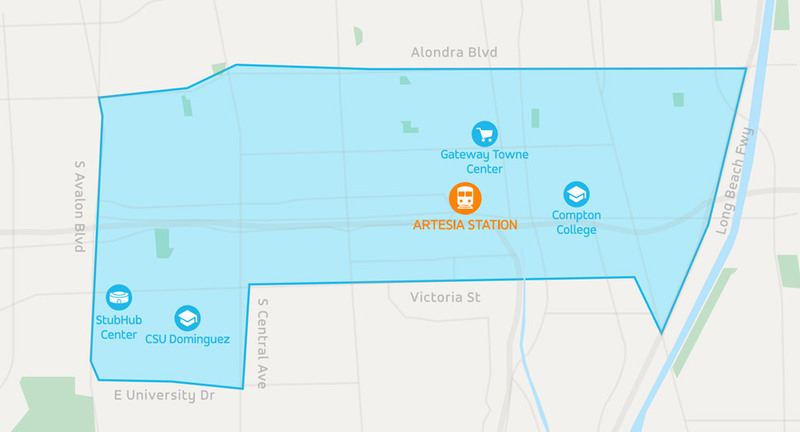 Via currently operates in Los Angeles Monday to Friday, 6am to 8pm, providing trips to or from the El Monte, Artesia, or North Hollywood Metro stations within the Via service zones. Metro and Via take safety very seriously. When you book a ride, Via connects you with a vehicle operated by a trained and experienced driver who is covered by the required insurance and has undergone pre-employment drug tests. Via’s app is available for both iPhone and Android. It’s free to download. You can also create an account and request a ride through Via’s Live Support call center at (619) 731-0710. The number of passengers you will share a ride with varies depending on who’s headed in the same direction at the same time and the make and model of the vehicle picking you up. Capacities range from 3-6 passengers per vehicle. I don't speak English. Is there someone I can speak with to book a ride or create my account ? Via offers live translation services. If you would like to book a ride, create an account over the phone, or contact Via's live customer support, please call Via at (619) 731-0710 and Via will connect you with the appropriate translator to help assist you. I don't have a smartphone. Can I still create an account ? Yes, you can create an account over the phone. Please call Via's Live Support number at (619) 731-0710 and Via will connect you with their PCI certified agents who will be able to take your credit, debit, or pre-paid card information over the phone and set up your account. How do I get the Via app ? The Via app is currently available for iPhone and Android devices. How do I create a Via account ? Refer to Via’s Help Center here for a step-by-step guide on how to create a Via account. Why does Via need my card number ? When you sign up for Via, they ask you for a credit card, debit card, or pre-paid card. You can use any credit/debit/pre-paid card to pay for Via. Each time you take a ride or purchase Ride Credit, payment is simple and seamless – Via automatically charges your card on file. The best way to pay for Via is to buy Ride Credit in the app. Before you ride, go to the Menu screen in your app, choose "Ride Credit," and select how much you'd like to buy. Each time you take a ride, Via will simply deduct the cost of your ride from your remaining credit. If you ever run low on credit, Via will deduct any remaining credit and charge the card on file directly for the remainder of your ride. How do I book a ride ? Refer to Via’s Help Center here for a step-by-step guide on how to book a ride. Where do I wait for my Via ? As we are a corner-to-corner service, your actual pick-up spot – if you are traveling TO a Metro station - may differ from where you asked to be picked up . It’s usually the corner closest to the pick-up location you requested, but you may be asked to walk a few blocks. Sometimes, the app will give you the address or business name at your pick-up spot to help you find it. 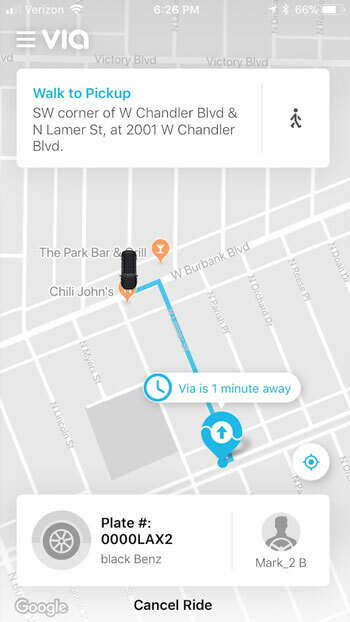 Either way, the exact pick up location will always be displayed in the app. Make sure you’re at the pick up spot when the vehicle arrives! The app will count down the minutes to your vehicle’s arrival, and Via will send you a text when the vehicle is two minutes away and again when it arrives. For assistance, you can reply to that text and our Live Support team will help out. Additionally, you can contact the driver partner at any time directly through the app by pressing the small green phone icon located on the right, at the bottom of the screen. Remember: Via is a community, and you’re sharing your ride with other members. Keeping them waiting does not make for a good customer experience, and if you’re more than 60 seconds late, the vehicle will just have to leave. How do I know when my Via will arrive ? After you set your pick up and drop off in the app, Via will give you an estimated time until your Via arrives. When your car is 2 minutes away, Via will send you a text message to let you know that your ride is getting close. When your car arrives, Via will send you another text to let you know! How much does a ride cost ? Registered Metro LIFE (Metro's Low Income Fare Program) participants ride for free. How do I become a LIFE (Low Income Fare Is Easy) participant ? To find out If you are eligible to join Metro's LIFE (Low Income Fare Is Easy) Program and/or to register to join the LIFE Program, call the LIFE hotline number at (213) 922-2378 or email lifeinfo@metro.net. Can I request a specific time for my pick up ? No. Via operates on-demand only. Just book a ride a few minutes before you need to leave, and Via will connect you with a vehicle in real-time. What do Via vehicles look like ? The best way to identify your Via-cle is by checking the license plate number displayed in your app and in the text messages you receive from Via. Additionally, our Via-cles sport a magnet on the side, so you can easily spot them when they pull up. Just check to make sure the license plate number matches and you're all set to board! How do I know which car is mine ? When you book your ride, Via will list the information about the car coming to pick you up directly in the ride screen. This will include the license plate number as well as the type of car. When the Via-cle is approaching, Via will send you a quick reminder text with this information (as well as the pickup spot). Once the vehicle has arrived, you'll receive another text and a "Your Via is here" notice in your app. How old do I have to be to use Via ? I am a wheelchair passenger. Do you have vehicles that can accommodate me ? Yes! If you need a wheelchair accessible vehicle, make sure to toggle on the “Wheelchair Accessible” option under your account profile. You will then be matched with a wheelchair accessible vehicle for your ride. Where can I enter my TAP card information to qualify for $1.75 rides ? Refer to Via’s Help Center here for a step-by-step guide on how to enter your TAP card information. My driver was great! How can I thank them ? If you had a great experience with a driver, please let us know by filling out the feedback screen after your ride. How do I retrieve something left in a Via ? As soon as you realize an item is missing, please let Via know by e-mailing them at losangelesriders@ridewithvia.com, and they will put you in touch with your driver to track it down! Please note, unclaimed items will be donated after 30 days. Refer to Via’s Help Center here for a step-by-step guide on how to change your account password. I'm not receiving my temporary password. What do I do ? Please email Via at losangelesriders@ridewithvia.com and they can reset your password for you manually. Why is my place-pin in the middle of the ocean ? Please make sure that Location Services are enabled for the Via app on your phone (Settings - Privacy - Location Services), and that should bring you back to dry land STAT! Can I change my destination once I’m in the car ? While Via aims to please on every ride, in the event that a change would delay another passenger in the car or awaiting pick up, Via can't accommodate requests for changes to drop-offs. You can always shoot Via a text mid-ride, and they will certainly try their best to accommodate your situation. If you haven't gotten on board yet, just cancel the ride and re-book with the new destination! Where can I see my past rides and purchases ? My driver left without me! ? If you were marked as a ‘No Show’ and you still need a ride, please re-book directly in Via’s app, and send an email to losangelesriders@ridewithvia.com so Via can look into what went wrong. If your app is indicating that you were picked up, please text Via’s Live Support Team directly by replying to any message Via has sent you, so that Via can cancel that ride and make sure you are able to re-book. Can I ride with my pet ? Can my child ride with Via ? Children are welcome in Via-cles! Via and Metro strongly encourage all parents to bring a car seat or booster seat where appropriate. Please note that all children, regardless of age, must be marked as an additional passenger when booking your ride. This requirement is due to vehicle capacity restrictions based on number of passengers. Can I smoke or use an electronic cigarette in my Via ? Can I eat in the vehicle ? Please help Via keep Via-cles clean and fresh and avoid bringing food and drink in our cars. If spills occur, Via will have to charge you a cleaning fee! I was charged a cleaning/damage fee - what is this ? Via's driver partners work hard to maintain their vehicles and take pride in their upkeep and cleanliness. In the event that the interior or exterior of the vehicle is damaged or dirtied as a result of intentional or negligent acts such as aggressive slamming of doors, vomiting, or pet accidents, a fee may be assessed and charged when applicable. Can I use my phone while in a Via ? Please be considerate of other members in your Via-cle and limit phone calls to quick logistics and emergencies during shared rides. Can I bring luggage/personal items in my Via ? Your Via is a shared space, and as such Via asks everyone to limit any personal items to a single piece of luggage or a reasonably sized bag. Think of it this way - if the passenger who showed up before you had the same sized item and the car was at full capacity, would your item fit as well? If the answer is no, then Via can't guarantee they will be able to take you and your bag on board. Can I ride with my musical instrument ? Via has a strict Zero Tolerance policy. Via does not tolerate the use of drugs or alcohol by drivers on the Via service platform, nor does Via tolerate inappropriate behavior by drivers towards passengers. If you believe that your driver may be under the influence of drugs or alcohol, if your driver is behaving in a manner that you consider inappropriate or that makes you feel uncomfortable or unsafe, or if your driver engages in conduct which could be considered unlawful or illegal, please ask the driver to terminate the trip immediately. If you feel that you are in imminent danger, please contact the police directly by calling 911. After the ride has concluded, please provide feedback using the Via app, reply to the text message confirmation of your ride, or email losangelesriders@ridewithvia.com to report the issue. Riders can also report substance abuse issues to the CPUC at 1-800-894-9444 and CIU_intake@cpuc.ca.gov.